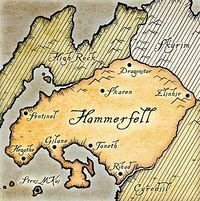 Skaven is found in northern Hammerfell, near the Dragontail Mountains, in what is generally considered territory of the Crowns. On the northern outskirts of Ska'vyn lies the Caverns of Wry, which contains herds of Skav Bats, who are bred to produce dairy, specifically, Bat Cheese, which is supposedly paired well with Pomegranate wine. In the Skaven countryside lies the local Hall of Virtues of War, which were training halls for the Sword-singers of Hammerfell. Skaven is neighbored by several settlements, including Cliff Keep in the east, Heldorn Mount in the northeast, and Verkarth City in the southwest. At some point in 2E 582, the Dragonstar Caravan Company had moved their headquarters from Craglorn, and into Ska'vyn. During the Imperial Simulacrum in the late Third Era, the city-state of Skaven was an active settlement, being ruled by Queen Mijurti. It had a rivalry with Dragonstar. During the Great War, the Imperial Legion, under General Decianus had a bloody skirmish with the Third Aldmeri Dominion outside of Skaven's wall, which led to the city's capture by the Aldmeri Dominion. However, at this point, Arannelya's forces were unable to advance in their campaign. In 4E 174, General Decianus was forced to return to the Imperial City, but being unwilling to abandon Hammerfell, Decianus had sent a group of warriors who were able to retake Skaven from the Dominion. A Redguard named Luah Al-Skaven was known to be living in the Nordic ruin of Ansilvund in Skyrim around 4E 201, but it is unclear whether she has any connection to the town. This page was last modified on 5 February 2019, at 03:19.